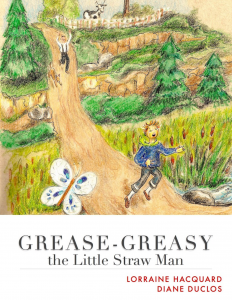 Lorraine Hacquard and Diane Duclos are presenting their first children’s storybook, Grease-Greasy, the Little Straw Man. Discover how this playful and inquisitive little fellow appears into the lives of a childless couple. Soon, he begins to look for adventure, but quickly finds himself caught up in a trying situation. As he struggles to regain the safety of his new home, he begins to realize the importance of having a family. This family folktale dates back to more than one hundred years ago. The story line is simple, but it is fraught with references to natural phenomena and rural lifestyle of olden days. Each page is beautifully illustrated and harbors interactive elements which link to nursery rhymes, sound effects, photo galleries and short educational film capsules. This surprising storybook is sure to captivate and stimulate a young audience. Click here to obtain this interactive ebook. To obtain a printed version of this book, click here. 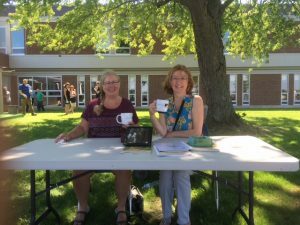 Lorraine Hacquard and Diane Duclos presented a workshop at the New Frontiers School Board in August 2016. They introduced their book, Graisse-Graissou, and its English version, Grease-Greasy. They went on to describe activities listed in their Livret d’accompagnement, which offers a project-based approach to using this folktale within a classroom setting. November 2016 – Story Time With an Author at the New Liskeard Public Library in New Liskeard, Ontario. Meeting school groups from l’École Catholique Assomption in Earlton, Ontario. Meeting school groups from l’École publique des Navigateurs at Temiskaming Shores, Ontario. December 2016 – Meeting school groups at Ormstown Elementary School in Ormstown, Québec. February 2017 – Meeting school groups at Centennial Park Elementary School in Châteauguay, Québec. February 2017 – Meeting preschool-aged children at the Châteauguay Public Library.